Nim lives on an island with her father, Jack, a marine iguana called Fred, a sea lion called Selkie, and their friend Alex Rover, the adventure writer. Nim's island is the most beautiful place in the world, and she wouldn't swap live anywhere else. When Jack invites a group of scientists to visit, they bring their children as well. But two of the scientists have plans other than studying algae... By the time Nim discovers what they really want, and what they will do to get it, the children are in grave danger. And so is the island! Nim must choose between saving a natural treasure and saving someone's life. Wendy Orr was born in Canada and spent her childhood across Canada, France and the USA. Wherever she lived, there were always lots of stories, books and pets. Once, when she was on a ferry going to visit her grandparents, Wendy saw a tiny island and wished that she could live there. Instead, she wrote a story about a girl who runs away from an orphanage to live on a small island. Many years later, when she was a grown-up writer, Wendy remembered the feeling of writing that story, and started writing Nim's Island.One day a film producer in Hollywood took Wendy's book Nim's Island out of the library to read to her son. The next day she asked if she could make it into a movie. Wendy said yes! They became good friends, and Wendy had the fun of helping work on the screenplay. Wendy began writing for children after a career as an occupational therapist. She is the author of many award-winning books including Nim at Sea, Raven's Mountain and Peeling the Onion. The story itself is very good. However it is also very confusing. We read Nim's Island and Nim at Sea. Neither book mentions Edmund at all, (although he is briefly introduced in the first movie). Rescue on Nim's Island introduces Edmund as a character who we should already know and refers to past adventures that he and Nim shared, yet they didn't... It took several chapters of being totally confused and even looking for Edmund in Nim at Sea before we shrugged and just enjoyed the book. Maybe Edmund was in the second movie? 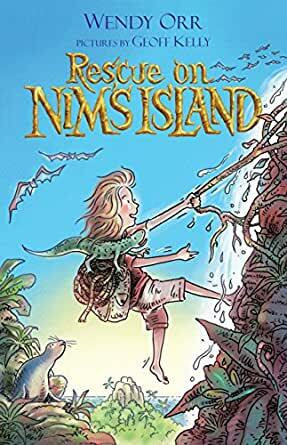 If so, there should have been another book between Nim at Sea and Rescue on Nim's Island. Despite that my kids (ages 7 and 11) loved all three of Nim's Adventures as Read Alouds. My 9-year-old daughter loves this book. I bought it after I watched the movie and knew she would enjoy it. I was right. My boys, ages 11, 8, and 6 love the Nom series! My 9 year old daughter loves these books.